-- Select a Size -- X-Small Small Medium - Out of Stock! Large - Out of Stock! X-Large - Out of Stock! 2X-Large - Out of Stock! 3X-Large 4X-Large - Out of Stock! 5X-Large - Out of Stock! 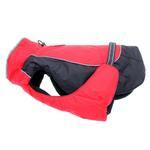 Hit the streets and the slopes in style with the Alpine All-Weather Dog Coat in Red and Black! 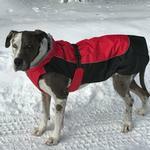 Alpine All-Weather Dog Coat by Doggie Design - Red and Black Customer Photos - Send us your photo! I purchased this jacket as a gift for Jax little buddy Louie. It’s adjustable and great for cold wet weather. Great purchase from BaxterBoo. Our Foxy Loves Playing in the Snow!! This Jacket Keeps Foxy Warm And Dry and Has A Reflective Strap for Night Time Walks.It Also Keeps the Cold Wind out with Its Great Drawstring Adjustment.Foxy Loves the color Red!! !This is A Great Winter Coat!!! Hi ?? This is Foxy ?? ?? ?? ?? Sprinting in Her Red Alpine Jacket ?? ?? Foxy ?? Loves it because its Light And Waterproof ?? Its Foxys Favorite Color ? Happy She Is running out to Play ?????? This s Foxy! !Enjoying A Walk in Her Alpine Red Jacket ?? Foxy Loves it because its Warm Light And Comfortable ?? ?? it doesn't Slow Her Down At All ?? ?? ???? The Winters Are Cold in Longisland N.Y.This Jacket is Perfect For Foxy???? This is Foxy Enjoying. The Winter In LongIsland New York?? ? ??? This Alpine Jacket is Keeping Foxy warm and Happy?? Foxy Never Misses Her Time out In The Snow ? Red Is Foxy!! !Her Favorite Color ?? ?? ?? ???? ?? ???? Posted On 02/08/19 by Tina from Adams, MA Yes, Tina recommends this product! I purchased the Blue puffer version of this coat last year and loved it. We actually still use it, however, the outer shell ripped so I wanted to replace it with something with a smoother outer shell. The sizing chart is the same between the puffer version and this one. This coat is too small. I would need a girth extender to allow for a comfortable fit. Posted On 11/24/17 by Tina R from Philadelphia , PA Yes, Tina R recommends this product! I just bought this coat and it fits so good in him and he looks like it would be really warm for him! Posted On 02/23/17 by lillian b from Elizabeth, IN Yes, lillian b recommends this product! looks great on my american bully. Finally a coat that is long enough! Got a 4xl to fit male that has 34" chest and is 31" long and 97 pounds. Coat has extra room for growth. Great quality. Nice and warm for my 6 pound Miniature Schnauzer puppy. Like the access to the hooks on halter. Easy to put on and take off. Highly recommend. Posted On 02/07/17 by bong c from , NY Yes, bong c recommends this product! Posted On 01/29/17 by Susan R from Bellingham, WA Yes, Susan R recommends this product! The coat is a very nice design and seems like nice materials, but the size runs large (I know, not the usual problem) except for the neck, which is small compared to the size of the rest of the garment. If you have a dog with a larger head proportionally to its body (for example a French Bulldog) this is not the right coat for you, because the neck has no give. Posted On 01/18/17 by Renee T from Baltimore, MD Yes, Renee T recommends this product! I was looking for a winter coat that was both waterproof and insulated. I ordered this coat in a 2XL for our blue pit. He looks good in it and I believe this coat will truly keep him warm during realy cold winter days. The shipping was fast and packaging was great. Posted On 01/06/17 by Nancy F from Calais, ME Yes, Nancy F recommends this product! Beautiful coat, but not for a large head. It's on its way back? ?Well made attractive coat, just not for a pitty pup. Posted On 12/31/16 by John F. S from Round Rock, TX Yes, John F. S recommends this product! Posted On 12/29/16 by Linda P from Crozet, VA Yes, Linda P recommends this product! I LOVE THE WAY THIS COAT FITS MY DOG AND MY DOG SEEMS TO LOVE IT TOO. Finally a coat that fits. Posted On 12/27/16 by Jessica F from Concord , NH Yes, Jessica F recommends this product! I have a pit mix who is about 40 lbs and really cannot tolerate the colder temperatures but all coats either were too tight and restricted arm movement or if not were loose. This coat wraps around and covered her and with the adjustable neck it doesn't hang. Thank you. Posted On 12/26/16 by Linda C from Spring Lake Township, MN Yes, Linda C recommends this product! We live in Minnesota where winter temperatures can be bone chilling, even in a fur coat! This coat will keep the wind and snow out, and has a cozy fleece lining. Best of all, it adjusts at the stand-up collar in addition to the girth strap for a really good fit! We had a difficult time figuring out what size to order for our 56 lb British Labrador. After 2 tries and 2 returns, we found a perfect fit with a 2XL. Well made, high quality garment that we expect to last a long time. Posted On 12/22/16 by Tracy S from Westfield, MA Yes, Tracy S recommends this product! Absolutely love this jacket for my dog! Needed something not only for length but for girth too! Perfect fit!!!! She is NOT one to wear jacket but she loves it!!!! Haven't seen anything compared to this quality or design! Posted On 12/18/16 by Leanne S from Noblesville, IN Yes, Leanne S recommends this product! I love these dog coats! The only reason I gave it 4 stars instead of 5 is because of the neck size. The coats fit my pugs everywhere except in the neck. They are just a little tight in a size medium, but a size large is too long and loose. I love the way these coats are so easily put on and taken off. The extra warmth on the chest is great! Posted On 12/18/16 by DOUG from , IL Yes, DOUG recommends this product! Posted On 12/16/16 by Jeri S from , NY Yes, Jeri S recommends this product! The only coat my pet Boxer did not tear off his body after we put it on him for a walk. Our dog loves this coat. He is about 70 pounds and it provided great coverage and protection against a bitter cold New York winter. Posted On 12/13/16 by Deborah C S from Lyman, ME Yes, Deborah C S recommends this product! I love this dog coat. I have ordered 4 of these for my 2 little Cotons. They really protect them from the elements and is easy on and off. I like the closure up over the back, it doesn't get caught in any of the fur. It also helps with ice balls collecting on their underside where the chest is covered. Plus, they come in great colors and looks really fashionable! Posted On 11/28/16 by Donna M from Keene, NH Yes, Donna M recommends this product! Fast service and great product. Coat is very well made and fits perfectly on my pup. She is not used to wearing a coat, so will take a little time for her to use it, but the coat fits perfectly and I feel confident she will enjoy wearing it, especially this winter.